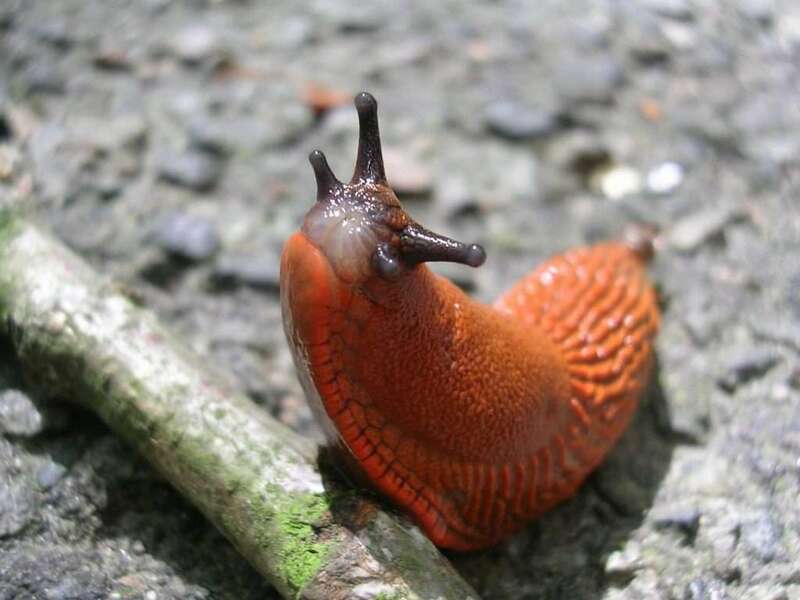 The use of slug pellets is the worldwide standard in the fight against snails and slugs. However, using poison against garden pests is unpleasant and in most cases makes problems even worse. The baits attract even more slugs from around the neighborhood. Unknown chemicals enter the garden. 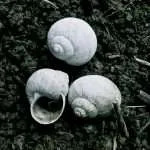 Beneficial and native slugs and snails die. They pose a danger to children, pets, and other animals. They can stimulate slug reproduction. Natural enemies of slugs suffer. They prevent natural checks and balances. 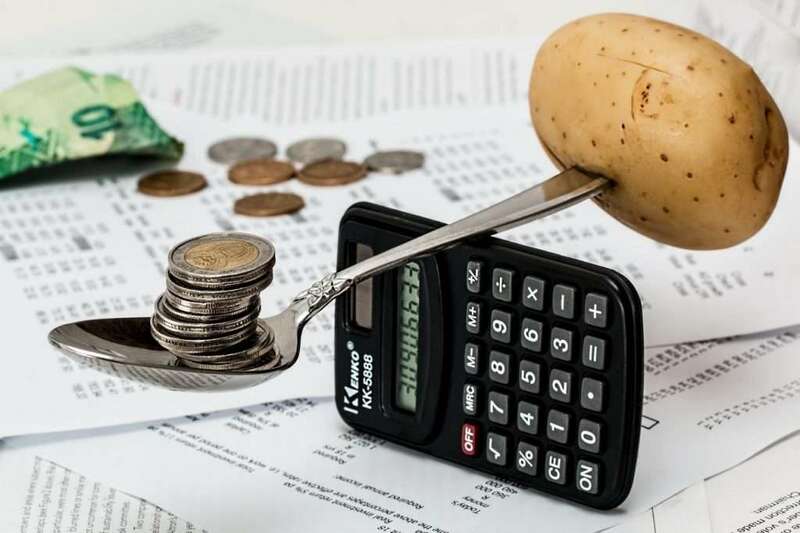 You become dependent on them and over the years lose a lot of time and money. Animal cruelty leads to negative feelings connected to the garden. For all these reasons, I recommend you do not use slug pellets but look at alternative ways to control slugs. Click on the link to find an overview of measures to control slugs and snails. 1 What Substances Are Used in Slug Pellets and Slug Baits? 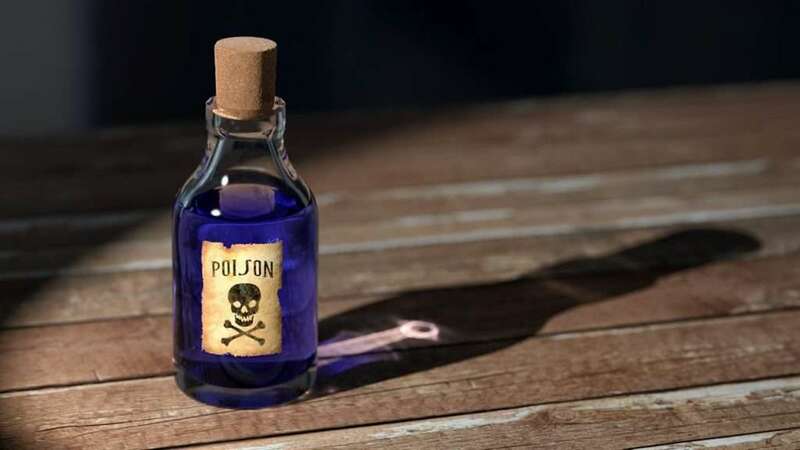 1.1 What Are Slug Poisons – Active Ingredients? What Substances Are Used in Slug Pellets and Slug Baits? 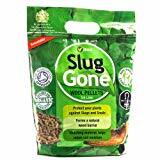 Slug pellets and baits contain molluscicides, which are poisonous substances that kill all slugs and snails. They also contain attractants that make slugs and snails eat the pellets. These attractants are powerful; that is why slugs and snails prefer eating the pellets instead of plants. At least for a short time, the plants are safe. In the long run, however, pellets cause a lot of harm. They fight only the symptoms but not the causes of the problem. Apart from the poison, manufacturers do not need to indicate what other chemicals they use in the baits. Be aware that by using pellets you are putting chemicals in your garden, and they might end up on your table and in your food. 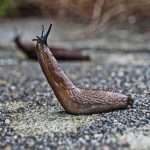 What Are Slug Poisons – Active Ingredients? Slug pellets contain three main types of poison – iron(III) phosphate, metaldehyde, and methiocarb. 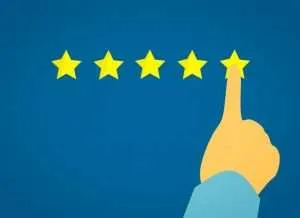 Each acts quite differently and has distinct advantages and disadvantages. 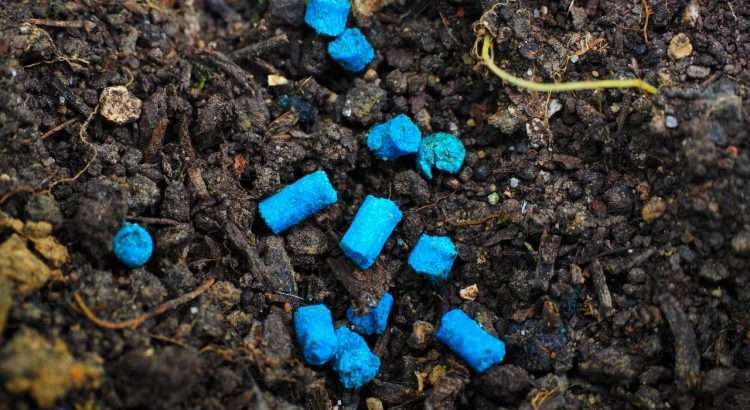 Some pellets are even lethal to humans and can pollute groundwater. Methiocarb and metaldehyde can be fatal to humans and pets. If poisoning is suspected, contact a doctor and call an ambulance immediately! The most common snail and slug poison is iron phosphate / ferric phosphate. At first glance, it seems harmless and is even approved for use in organic farming. How Does Iron(III) Phosphate Work? After snails or slugs have eaten the poisoned baits, the iron blocks their throat and closes down their digestive tract. As a result, they can no longer eat and slowly starve to death. It usually takes a few days for them to die. Beneficial snails die if they eat slug pellets. 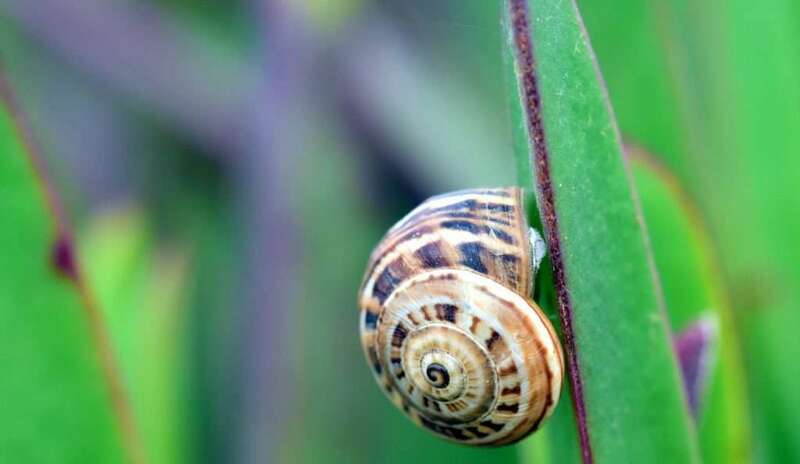 After eating the baits, snails and slugs find a place in which to hide and they die unnoticed. As they are not killed immediately, there is the risk that they will reproduce before they die! 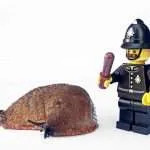 Dead slugs and snails cannot be collected because their bodies are hidden from view. The bodies release a smell of decay into the garden, and this attracts even more slugs from around the neighborhood. Although allowed in organic farming, iron(III) phosphate is a hazardous chemical substance that is not entirely harmless to humans. After coming into contact with the pellets, you should wash your hands thoroughly. This substance can also pollute drinking water, so it must not enter drains, surface water or groundwater supplies. Metaldehyde can be deadly to humans and animals, and it pollutes groundwater. 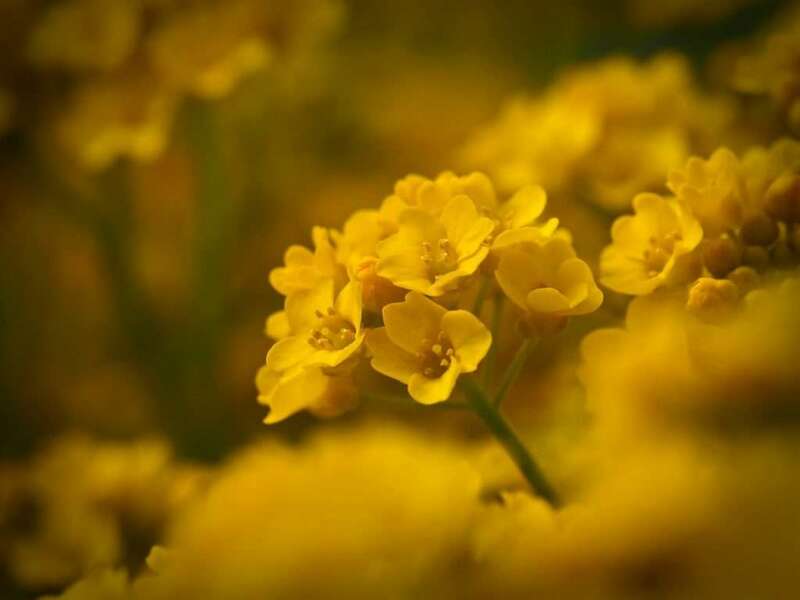 However, its use is still permitted in the garden and in agriculture. Metaldehyde is a contact poison. 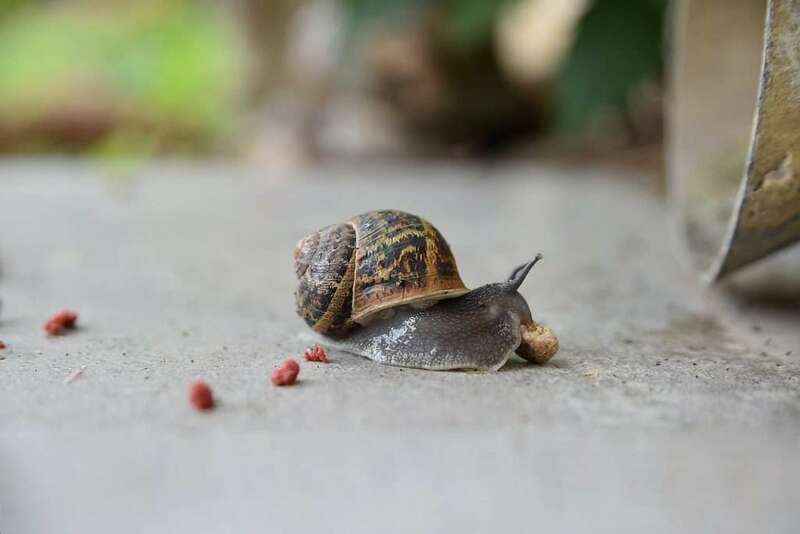 After slugs and snails have eaten or touched metaldehyde pellets, their bodies produce excessive amounts of slime and they slowly dehydrate as they try to flush the toxin out of their system. As a result, they die from internal water loss. If it has been raining or the ground is very moist, metaldehyde can become ineffective as the slugs can take in enough water to compensate for their losses. After slugs and snails have died, their bodies lie scattered around the garden. They must then be collected; otherwise, their smell will attract new slugs from around the neighborhood. 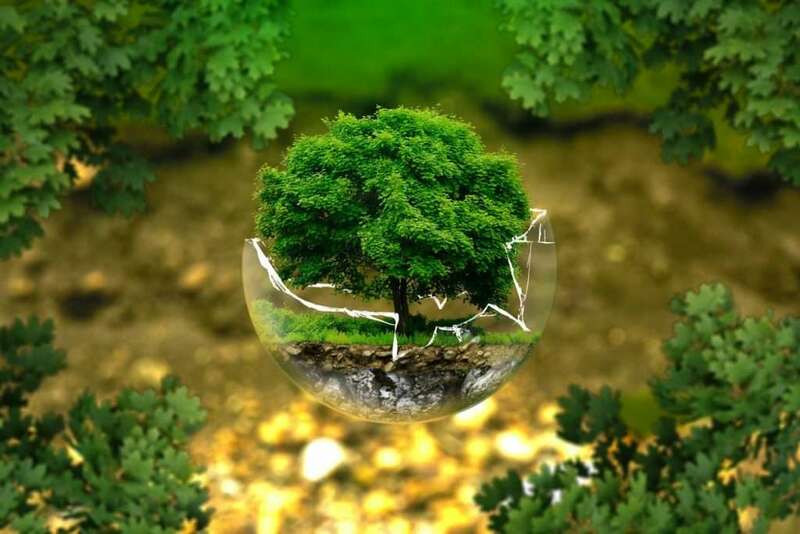 Metaldehyde was found in groundwater all around the UK because it is used a lot in agriculture. This might also be true for North America and other parts of the world and it might have an effect on general health. This is why some people advocate for the prohibition of metaldehyde. Used a lot during the 1990s, methiocarb has now been banned in most countries because it is fatal to humans and kills many beneficial animals and pets. Dogs, especially, like to eat methiocarb pellets and they can die quickly. Beneficial earthworms also suffer a lot. Old stocks of methiocarb slug pellets should be disposed of properly. Not only do all slug baits carry poisons, but they are also powerful attractants. That makes them a double-edged sword. 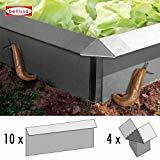 They attract slugs and snails from around the neighborhood into your garden and directly onto the vulnerable beds where you are meant to sprinkle them. Slug pellets dissolve over time and in wet conditions they start to go moldy. The attractants that are not eaten can seep into the soil and will attract slugs and snails even after the baits become invisible. Many people underestimate the fact that the smell of carrion is a strong attractant to most snails and slugs. 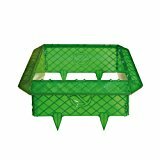 Therefore, slug pellets directly – because they contain baits – and indirectly – because they produce carrion – attract even more slugs from neighboring areas. If it is true that slugs can smell (e.g. beer) at a distance of over 150 yards (140 meters), this effect might reinforce the slug boom in your yard. Please be aware of this risk! Dogs can die after eating slug pellets. Slug pellets contain poisons that can also be dangerous to mammals. Metaldehyde can kill pets such as cats, rabbits, ducks, and dogs. It also poses a health risk to toddlers, babies, and children in general. 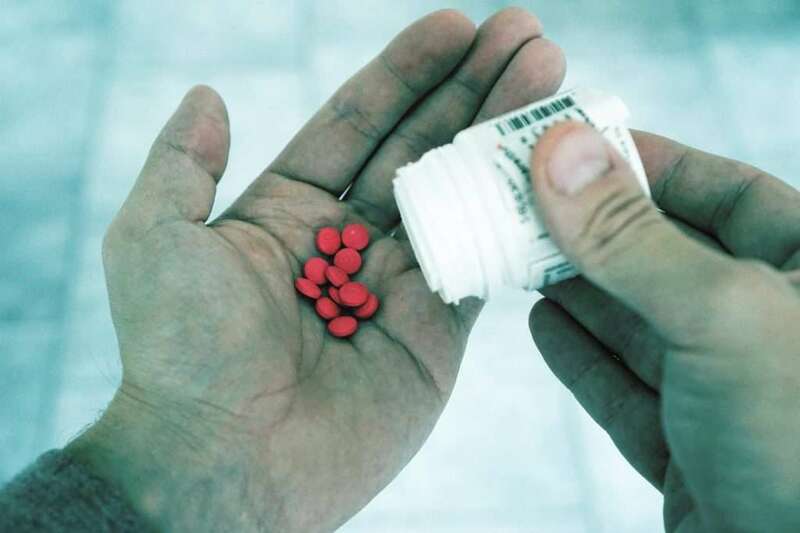 Even for adults, certain doses can be fatal. The toxicity of slug pellets should never be underestimated. Less than an ounce (just a few grams) of metaldehyde is enough to kill a human being. Dogs and cats have been known to die after ingesting slug pellets. 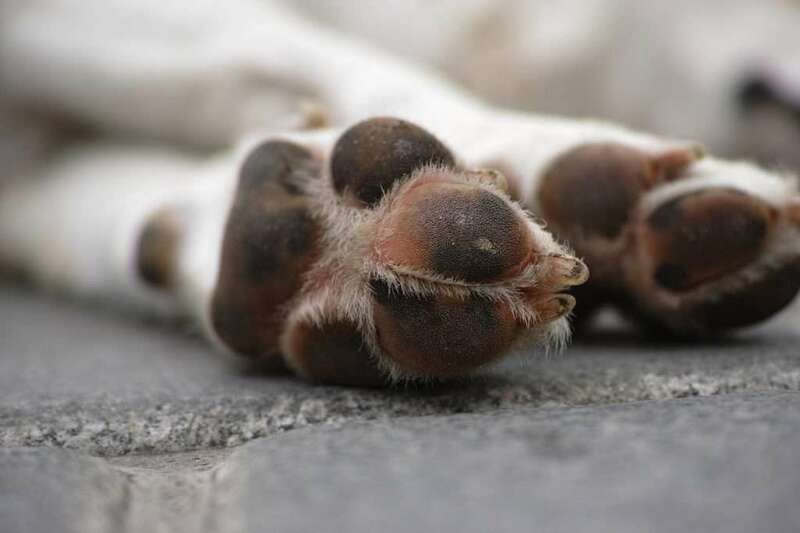 Dogs, especially, like to eat the pellets; a lethal dose for them is only about 1/30 ounce (1 gram) of metaldehyde. If you suspect poisoning in babies, children, or pets, seek medical advice immediately. Severe poisoning caused by slug pellets has even been reported in cattle and horses. Symptoms include breathing difficulties, vomiting, lack of coordination, cramps, and fever. A slug has laid its eggs. One significant setback of iron phosphate pellets is that they kill slugs and snails slowly within a couple of days. During this period, the slugs and snails stop eating, but can still mate and lay eggs. 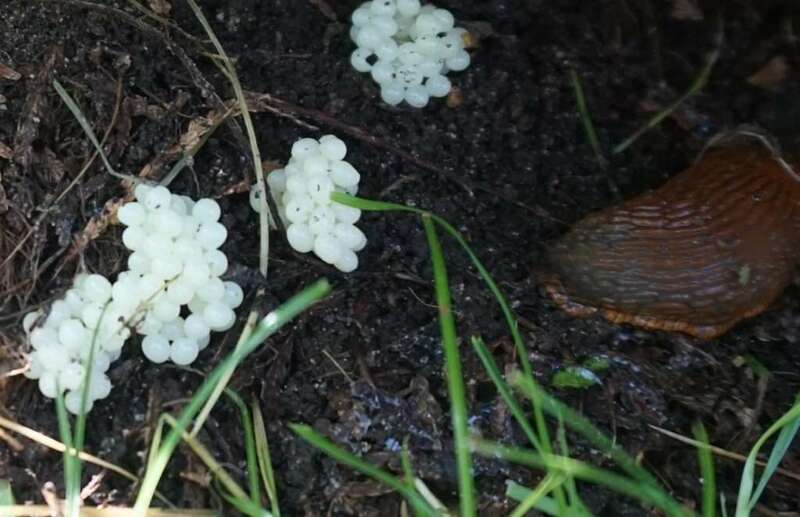 As a result, the natural cycle of reproduction is disturbed, which leads to an out-of-the-ordinary slug boom a few weeks after using the pellets. For every slug killed, 300 to 400 new ones could hatch. This leads to a slug ‘revenge’. 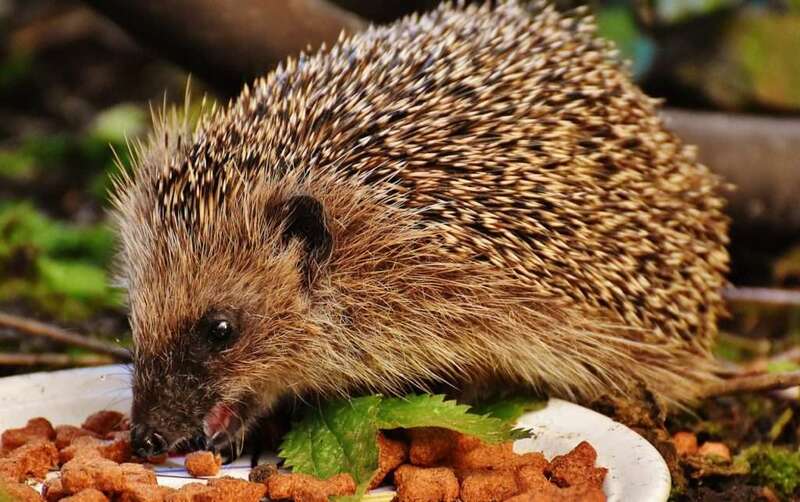 Hedgehogs, for example, suffer from the use of slug pellets. 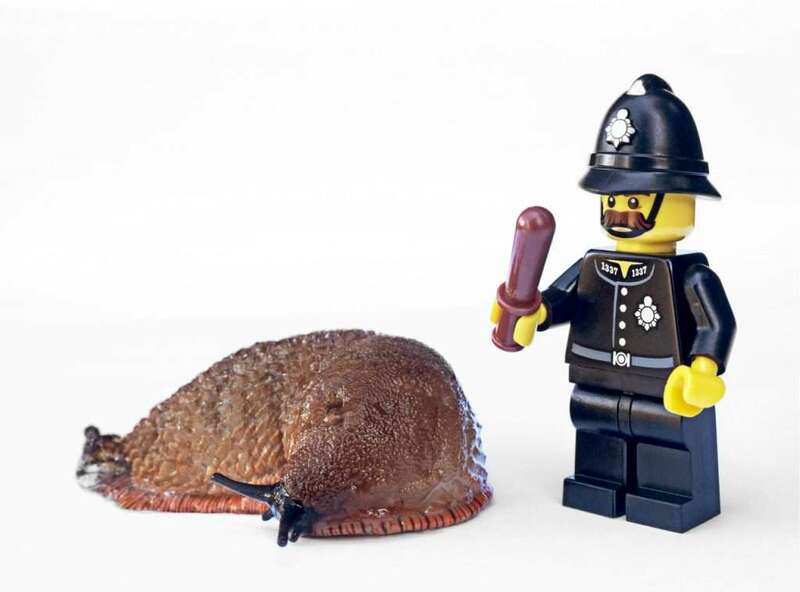 Some people say that invasive slugs and snails have no natural enemies. However, this is not the case in most places. Slugs and snails inhabit most of the world and have many natural enemies. Their eggs, young, and even adult slugs and snails are on the menu of all kinds of predatory animals. However, it is true that natural enemies have declined in population or have become extinct for several reasons. Often, they have suffered from the use of pesticides such as insecticides, herbicides, and molluscicides. These animals like the protein-rich meal provided by a slug, a snail, and their eggs. If invasive slugs or snails enter an ecosystem for the first time, it might take a while for the snail eaters to recognize them as a potential snack – but after a while, they will. If these animals eat poisoned slugs or snails, they might get injured, too. And if they do not die, they might feel sick and avoid touching a snail afterward. Slug pellets counteract natural checks and balances. If you use slug pellets, the restoration of natural checks and balances will be prevented. The use of poison sets a vicious circle in motion: ‘Harm set, harm get’. When poison is used to kill a prey population, the balances that exist between hunter and prey populations everywhere in nature cannot occur. There are, for example, many insects, such as the ground beetle, that specialize in hunting slugs and snails. If all slugs die suddenly, these animals lose their food supply and move to other areas. If they are dependent on snails and slugs, as glowworms are, they could even starve to death. As a result, the next generation of slugs can boom because it will face fewer natural enemies. 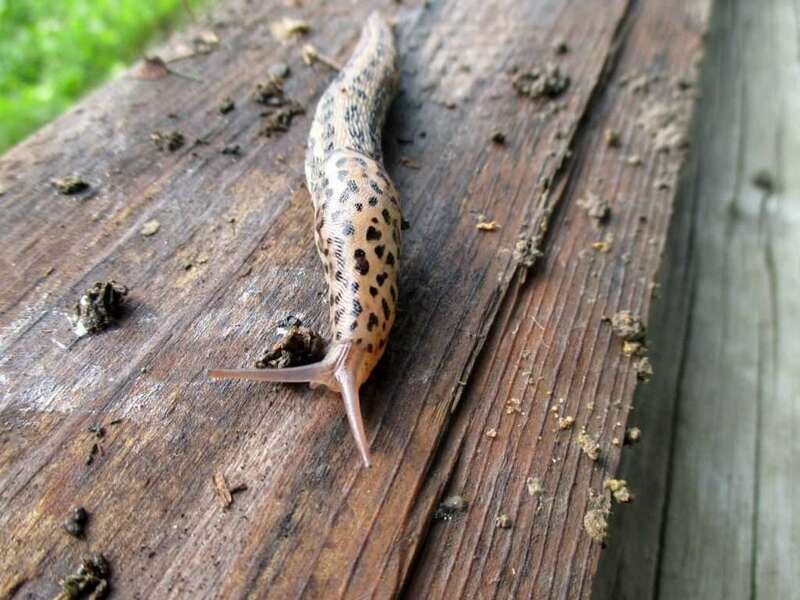 Beneficial snails and slugs – such as the leopard slug – die from slug pellets. Another big problem is that slug pellets kill all slugs and snails. Not only will invasive slugs (such as the Spanish slug) die but endangered native species will too. Most slugs and snails are beneficial to the ecosystem and are not usually a threat to healthy plants. They eat dead animals, fungi and old plant remains. 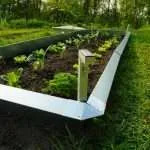 In this way, they are beneficial for plant growth. 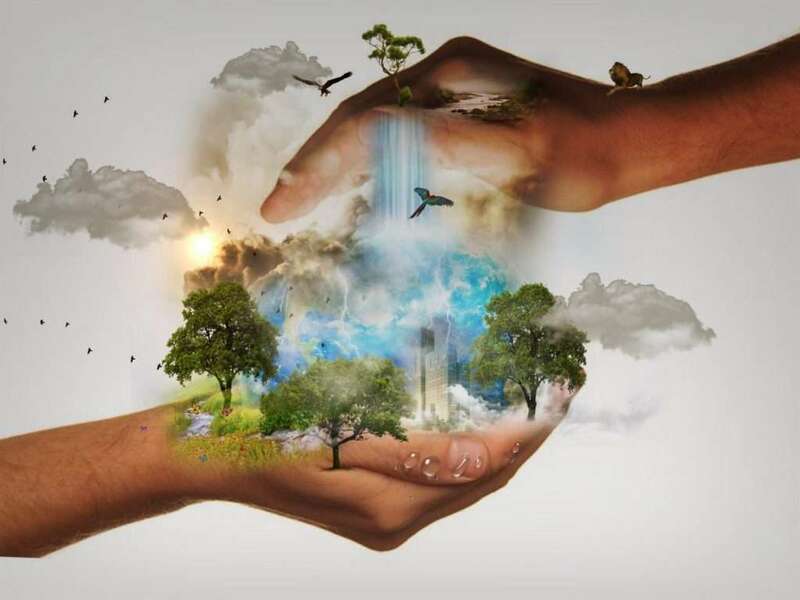 By recycling garden waste and producing useful humus, they increase soil health. As a natural part of the ecological system, native snails and slugs do not multiply explosively, as can happen with invasive species. In addition, some beneficial slugs and snails are natural enemies of invasive species. The Roman snail (garden snail), for example, eats the eggs of the Spanish slug. And the leopard slug (Limax maximus) not only eats the eggs of other slugs but also hunts down adult Spanish slugs. So, it is a disaster that slug pellets also kill these beneficial slugs and snails. Slug pellets cost time and money year after year. It takes a lot of time and effort to buy and apply slug pellets, again and again, year after year. The pellets are not cheap, and their application accumulates considerable costs over time. This money could be invested in long-term solutions such as slug collars or slug fences. Or you could use it to promote the settlement of natural slug enemies. Once used, your garden becomes dependent on slug pellets. Similar to a medication that brings short-term relief, slug pellets work only for a brief period. The plants around which you scattered them are spared for a while. But this effect does not last long. Once the baits have disappeared, the slugs come back. So, the pellets have to be scattered, again and again, year after year. They make the garden dependent, and one could say addicted. The garden cannot develop its natural defenses, so immigrating slugs encounter little or no resistance. And as described above, more and more slugs are attracted. This situation may result in the need for even more pellets. This development benefits the manufacturers of slug pellets greatly. A sustainable solution is not in their interest. If slug pellets had a long-lasting effect, sooner or later their customers would disappear. If you want to protect the environment, stop using slug pellets. Nobody likes to kill snails and slugs. At least this is true for all the gardeners I talked to. The use of poison usually leads to remorse. The act of killing is a problem. In addition, for many farmers and gardeners, the question of whether the chemicals used in the pellets will end up in their food remains unanswered. This creates negative thoughts associated with the garden and its fruits. From my point of view, a garden is a place of joy and happiness in which life flourishes and thrives in its most beautiful forms. This extraordinary space gets polluted by the use of poison. 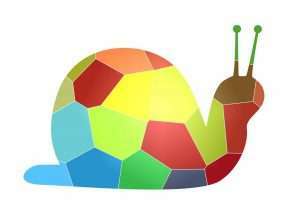 Can snails and slugs suffer? Another reason to question slug pellets is the way they kill. As described above, iron phosphate pellets act as feed inhibitors. If slugs eat them, they suffer the painful and slow death of starvation. That is why – from my point of view – iron phosphate pellets are a means of torture. Unfortunately, metaldehyde pellets are not a less painful alternative. After contact with metaldehyde, slugs and snails die from dehydration. They leak out all their body liquids and usually die from organ failure after internally drying up. Anyone who has ever experienced real thirst knows how painful this can be. So, death from dehydration or food deprivation is, in my view, a form of death that should not be suffered by any sentient being. Do snails also have a right to live? Starving a dog or causing it to become dehydrated is considered as animal cruelty and a violation of the law. There may come a time when even invertebrates will be recognized as having fundamental rights that should be protected. Of course, it is more difficult to empathize with a snail than with a dog or a cat. I believe, though, that it will eventually become apparent to everyone that snails can suffer, too. That is why more and more gardeners have stopped using poison and are trying to deal with slugs in a more ‘humane’ way. From my point of view, slugs and snails deserve respect, too. They are part of life and usually make a helpful contribution by processing dead plants and carrion. If you take a closer look at slugs and snails – and for a short time forget all the trouble they might cause – it becomes obvious what marvelous creatures they are. They deserve respect for what they do and for the way they live. To me, they are little Zen masters, and by observing them closely, it is possible to learn a lot about patience and tranquility. 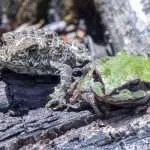 Maybe that is why they appear to be under nature’s special protection, and why most of the time and in most places it is impossible to win an aggressive fight against them. Fortunately, the use of poison is unnecessary; there is already enough know-how to protect vulnerable plants more peacefully. Reverence for life can be preserved in the garden. There are many natural slug control alternatives. There are environmentally friendly measures that can solve the slug problem. 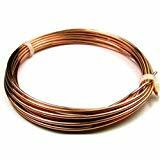 One of the simplest measures is to use copper against slugs. Another very effective method is to use slug fences. 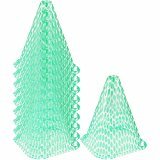 There are different types of mechanic slug fences, and with simple means it is possible to create an electric slug fence. 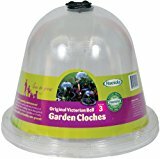 Using cheap or leftover materials, you can also make plant protection hats and garden cloches that can protect young plants. 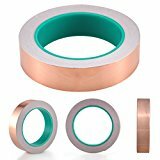 Slug collars can also be made at home. To solve the problem in the long term, it is essential to help natural enemies of slugs to settle in your garden. 4.5 (90%) 6 votes - Glad you are here.